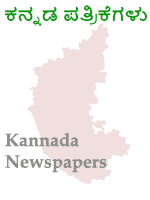 List of Kannada newspapers and Kannada news sites including Kannada Prabha, Prajavani, Udayavani, Vijaya Karnataka, and Vishwavani News. Leading Kannada daily newspaper based in Manipal. Read 2019 Elections News. One of the largest Kannada-language newspapers. A daily broadsheet format newspaper in Karnataka. Read 2019 Lok Sabha Elections News. It is one of the oldest Kannada newspapers, published by Vishwakshara Media Pvt. Ltd.
Kannada newspaper published from Mangalore and Bangalore. Popular Kannada newspaper primarily distributed in Tumkur, Chitradurga and Davanagere. Leading Kannada newspaper based in Bangalore. Daily newspaper based in in Hubli, Karnataka. The newspaper founded by Loka Shikshana Trust. A regional morning newspaper covering Kolar, Tumkur, Chickaballapur, Tumkur, Ramnagar, and Bangalore rural districts. Karnataka's only daily newspaper published in Sanskrit language. Kannada newspaper based in Raichur. Morning daily published from Mangalore, Bangalore, Shivamogga and Hubli. Kannada-language daily newspaper published from Belagavi, Karnataka.